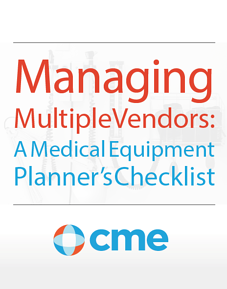 Download "Managing Multiple Vendors: A Medical Equipment Planner’s Checklist"
Medical equipment planners and project managers, responsible for coordinating large-scale purchases for healthcare facilities, have many obstacles to overcome in the work that they do. Beyond the challenge of dealing with many different types of vendors, you also have to keep the various departments of a healthcare facility working in proper sync. This checklist is for medical equipment procurement planners and project managers. It contains a description of specific concerns that you need to be aware of for each item. Complete the simple form, to the right, to access your checklist now.